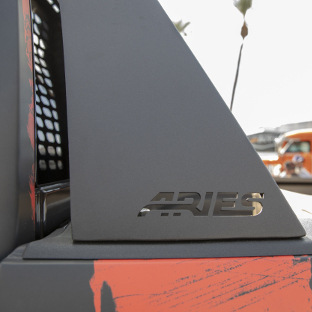 Unleashing your truck's potential for offroad style and aggressive attitude is easy with the ARIES Switchback® headache rack. It was designed to offer a highly unique look with its angular frame, mesh center section and truck-specific contours. 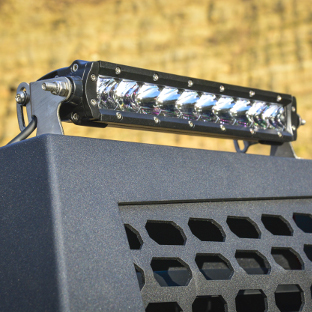 The Switchback® truck headache rack boasts an all-aluminum construction, versatile LED light mounting options and a patented mounting system -- all to give you an uncommonly stylish and versatile accent for your truck. 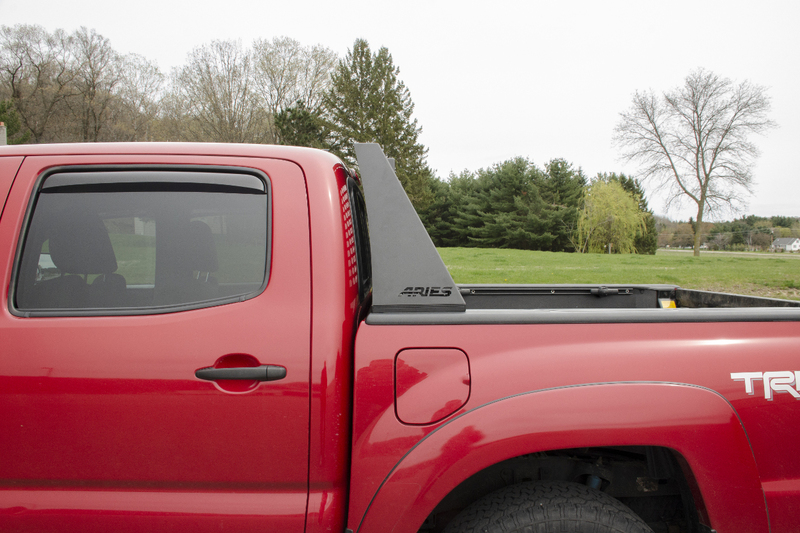 In addition to its lightweight aluminum construction and LED light mounting options, the Switchback® features a removable center section, providing easy access to the rear window of your truck cab. 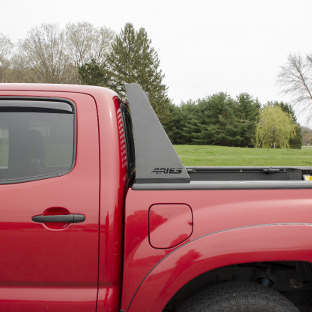 For an undeniably easy installation, the Switchback® headache rack mounts into place using a patented, stake pocket anchoring system: no drilling needed, one bolt to tighten on each side. It's that easy. 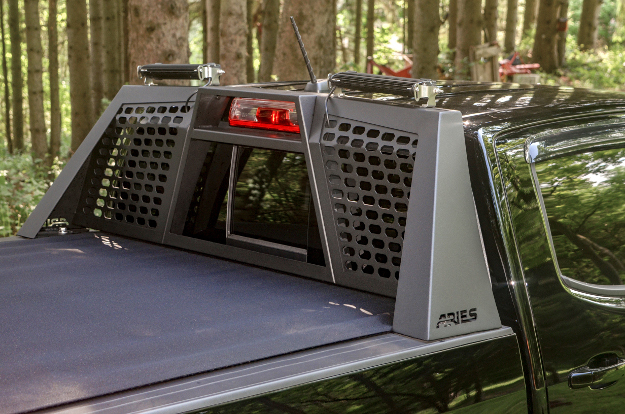 One of the best advantages of the ARIES Switchback® headache rack is its all-aluminum construction. Aluminum offers the perfect balance, being both rigid and lightweight. 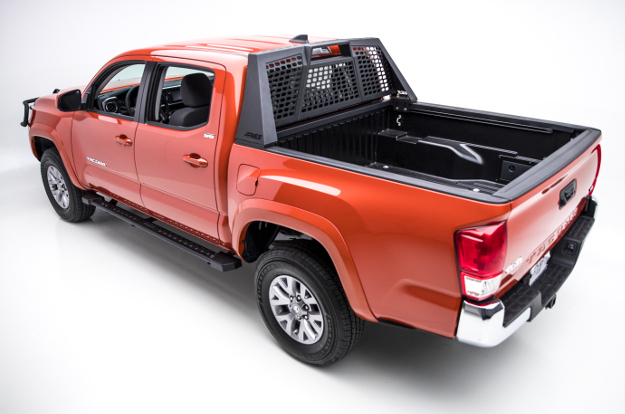 With its aluminum alloy construction, Switchback® offers extra cab protection, while helping to maintain your truck's modern fuel-efficiency. Aluminum is also highly impervious to the elements, remaining rust-free in spite of frequent exposure to rain, mud, snow and UV rays. 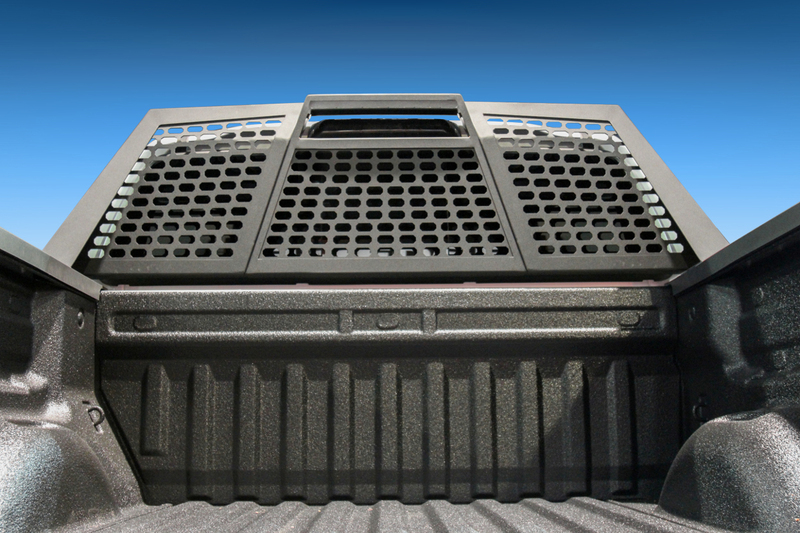 The top edge of the Switchback® truck headache rack is equipped with a slotted channel. 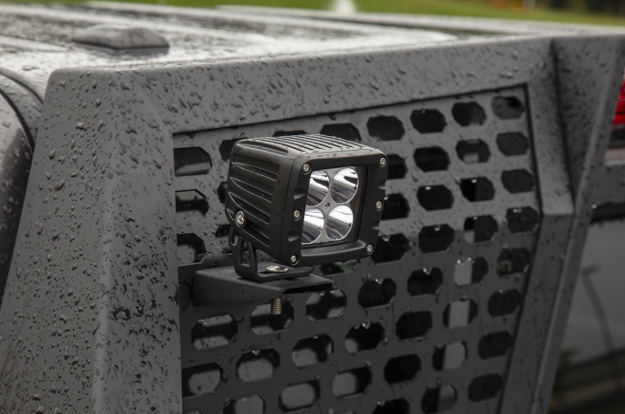 This channel allows LED light bars or square LED lights to be mounted over the truck cab or truck bed. 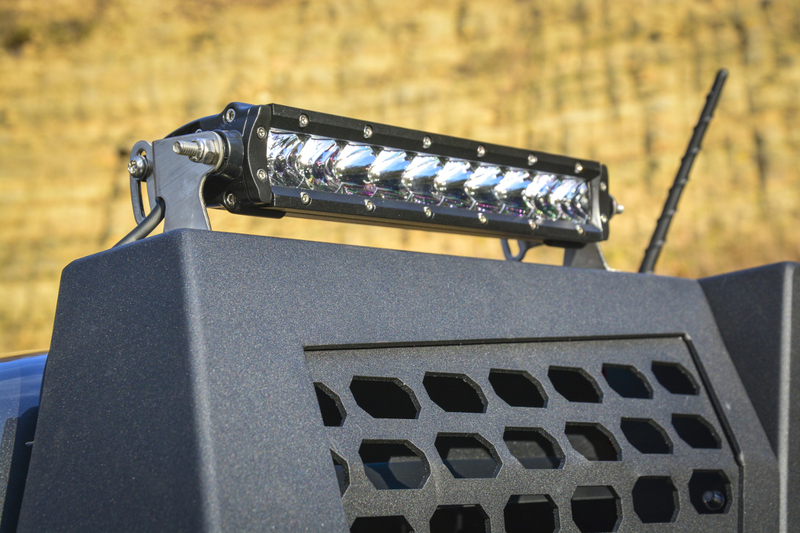 The channel extends the full length of the headache rack, allowing for easy adjustment of the lights to suits your needs and preferences. 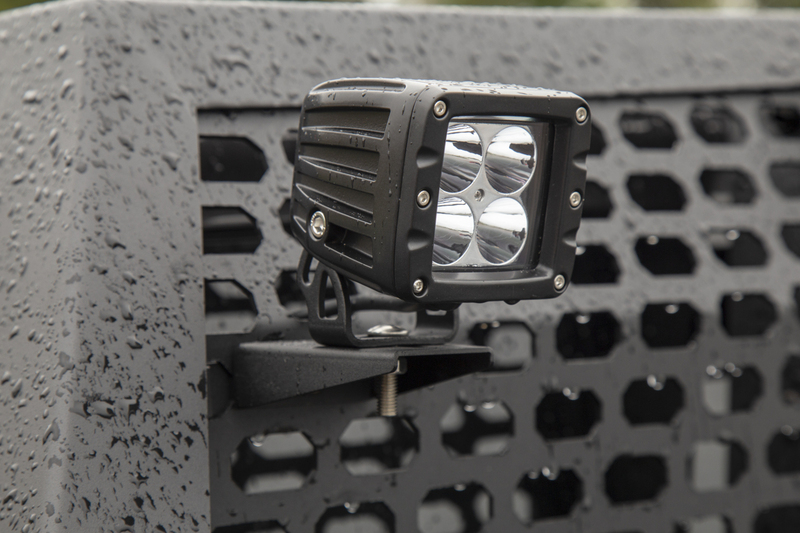 The center mesh sections of the Switchback® headache rack can also be used for mounting LED lights, using ARIES light mounting brackets #1110311. 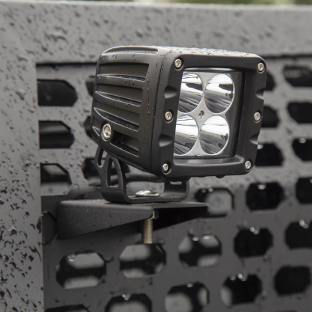 These brackets are perfect for adding extra, rear-facing work lights to light up the truck bed. 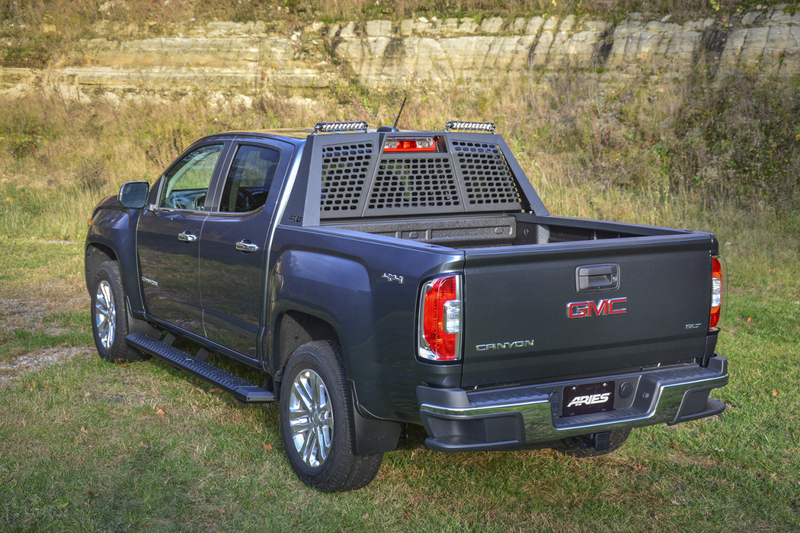 To ensure durability through every season of the year, the Switchback® truck headache rack is shielded in a tough carbide black powder coat finish. With this finish applied over the top of the already corrosion-resistant aluminum, the Switchback® easily stands up to any and all outdoor elements without cracking, chipping or fading. 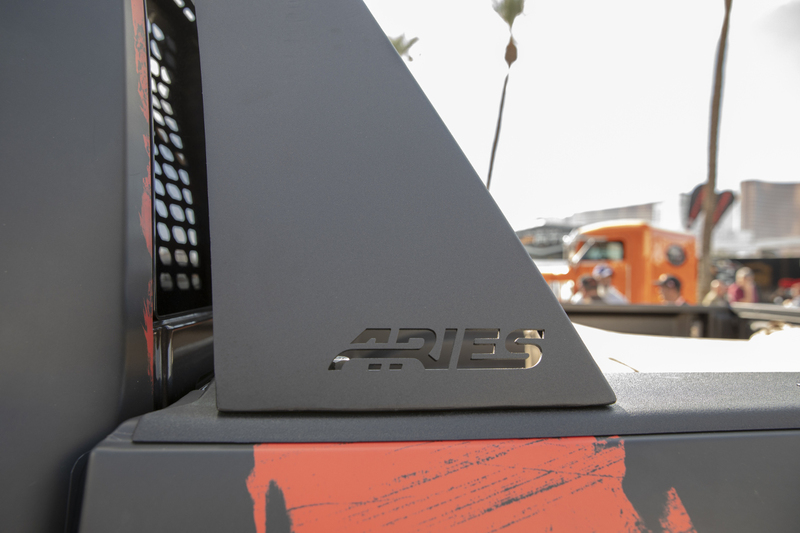 The finely textured carbide finish also gives this truck headache rack a bold, tactical look that's ready for the offroad trail. 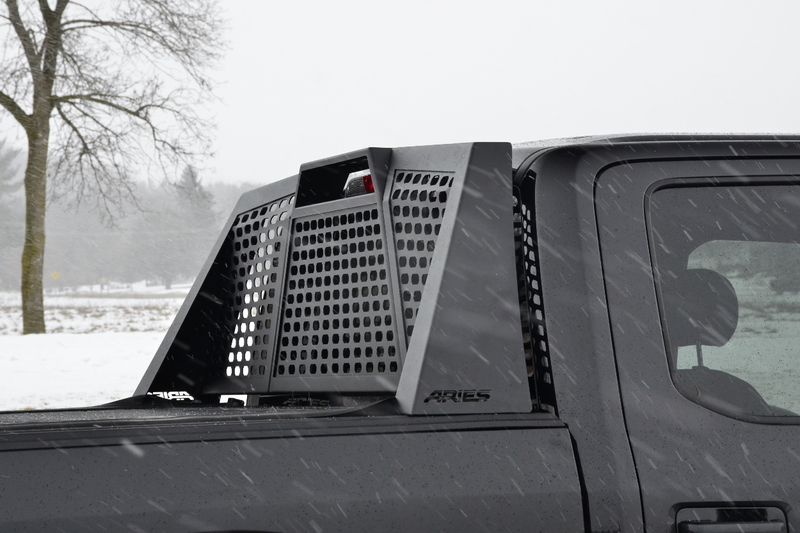 The angular frame and contoured design of the Switchback® headache rack truly set it apart from other rear cab protectors. 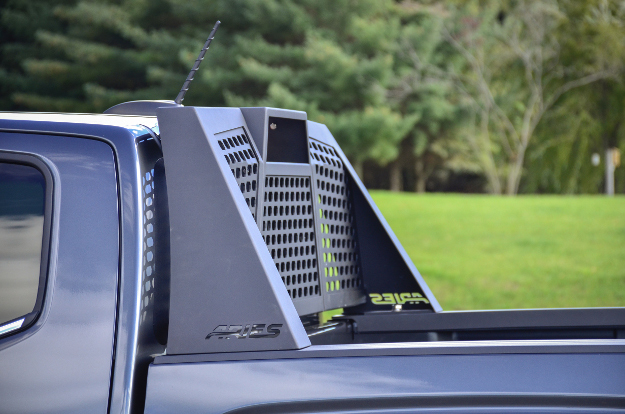 However, this offroad headache rack wouldn't be complete without its mesh center section. The protective panels are constructed from stamped, powder-coated aluminum and feature octagonal cutouts for a distinct look. 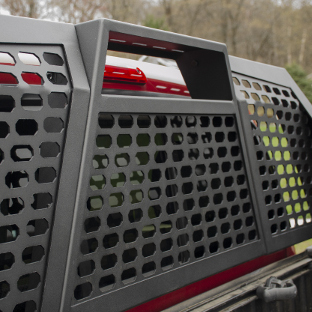 To maintain full functionality of your truck cab, the center section is equipped with a cutout for the third brake light, as well as a removable center panel. 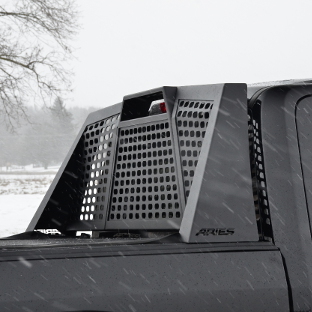 You can keep the center panel in place for extra protection or remove it to provide access to the rear cab window. 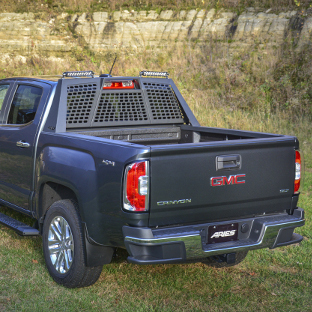 The Switchback® headache rack uses a unique installation system to streamline the process, making it fast, easy and very secure. 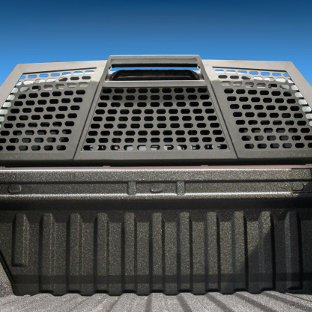 The system is a patented design that uses stake pocket anchors to simply drop into the truck bed wall pockets. This supplies the headache rack with superior rigidity and completely eliminates drilling from the install process. Installation couldn't be easier. The patented anchors use a single bolt on either side of the headache rack. Simply tighten the bolts, and the anchors lock into place, quickly and securely. 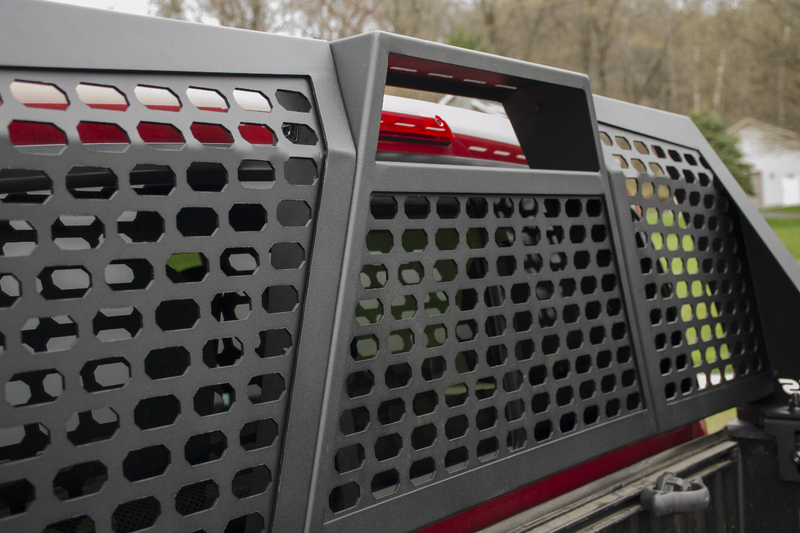 Another unique feature of the Switchback® truck headache rack is its three-piece assembly. While most headache racks have a large, awkward, one-piece design, Switchback® is comprised of a center section and two side sections. This makes the headache rack much easier to ship right to your door. The three sections securely bolt together during the installation, using high-strength grade-8 hardware.